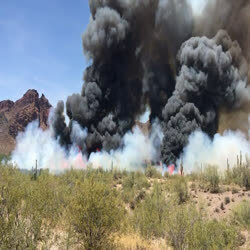 Incident Summary | A new wildfire named #Cactus has ignited in the Tonto National Forest, about 4 miles NE of Mesa, Arizona. It started on Tuesday, April 25th. Fire Fuels | Chaparral and short grass. Incident Cooperators | USFS, Maricopa County Sheriff Office and the Salt River Project. Fire Status | Fire personnel are starting to be released to be available should a new start occur. There is minimal smoke visible in the interior of the fire, however logs lying on the ground may put up small smokes for the next few days. Personnel | There are 75 personnel that remain on this incident. Fire Status | Fire crews have reached a 65% containment status and have been holding the wildfire at 818 acres. Crews are in mop-up operations on the fire’s edge and conducting patrols. Fire Status | 818 acres scorched and reached a 40% containment status. Firefighters are engaged in mop up activities on the fire edge and patrolling the fire area. They are making some great progress. Fire Behavior | Moderate fire behavior with creeping. Personnel | 80 personnel are still assigned to this fire incident. Fire Status | 500 acres burned with a 30% containment status. Firefighters plan to hold the fire south and east of the Salt River, while protecting an SRP power line that runs through the fire area. The Bush Highway, which was closed for several days, is now fully open. Resources | 2 crews. 6 engines. 1 helicopter. IC is Nick Castro ICT3 trainee managing 80 personnel. Threats | Numerous structures threatened. Firefighters are suppressing the fire and protecting power lines, recreation sites, highway guard rail and other values at risk. Additionally, wild horses that roam free on USFS lands. They have so far kept away from this wildfire.